Electronic Protection Device (EPD) Coatings Market size was estimated over USD 14 billion in 2017 and will exhibit growth of over 4.6% up to 2025. 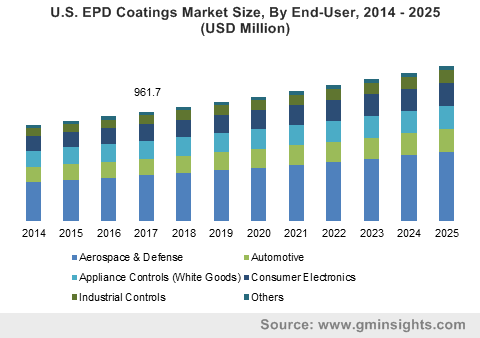 The EPD coatings market is strongly driven by global steady growth in automotive electronics & consumer electronics industry. In automotive industry, these coatings protect PCB’s from gasoline vapor, brake fluids from contamination and can be used in onboard computers and under the hood applications. Automotive electronics are becoming sophisticated and technologically advanced giving rise to need of functionality & reliability in demanding environments. According to OICA, the global new vehicle sales in 2017 accounted for over 96 million units, of which, the U.S., China, and Japan accounted for over 17.5 million units, 29 million units, and 5 million units respectively. Growing demand of safety enabled vehicles in developing countries such as China, India and Brazil; as well as slow but steady demand in developed countries such as U.S. and Japan will drive the electronic protection device coatings market. Consumer electronics industry, which consists of smart phones, laptops, cameras, headphones, tablets is one of the major EPD coatings market globally & accounted for almost 30-35% in 2017 led by rise in demand of smart phones. In 2017, the smart phones companies shipped about 1.45 billion devices, compared to 1.36 billion devices in 2016. The smart phones market is expected to grow by 3% each year till forecast period to reach annual shipments up to 1.68 billion units. China is the largest consumer electronics market globally and has surpassed North America because of strong economic growth & rising population. Rising demand of electronics goods from emerging markets such as India, Thailand, Malaysia, Argentina, Colombia, Peru, Chile and other African countries will drive the electronic protection device coatings market in the forecast period. Acrylic is the most commonly used coating material having almost 40% share in the total electronic protection device coatings market. Acrylic coatings easily dissolve in number of organic solvents for repairing work & have excellent chemical resistant. They also dry rapidly, have better fungus resistant as compared to other materials & emit very less heat during curing process which makes it ideal for various end-user segments such as consumer electronics, white goods. Silicone coatings are also one of the majorly used coatings especially for high temperature applications between -55 C to +200 C. They have high humidity resistance, good thermal strength, low heat dissipation factor & can adhere to various PCB materials. The silicone coating is one of the fastest growing EPD coatings market globally and is expected to grow by 4.4% during the forecast period to reach USD 5.7 billion by 2025. The other electronic protection device coatings considered are paraxylene, synthetic rubber, fluoropolymers. Paraxylene are high cost electronic protection device coating used in aerospace applications such as radar, surveillance systems & other military applications. The coatings used in protecting the electronic device are generally applied by 4 methods: dipping, brushing, spray manual and spray automatic. The selection of mode of application is dependent upon the size & complexity of the substrate Dipping process is used for low volumes & are good for coverage on complex parts of assembly. Brushing process is the most common method used and requires less capital investment, without masking & is easy for rework. Manual spray method is gaining importance since past few years as it is easy to use & requires less investments & can coat complicated designs of boards. However, this process makes it hard to maintain thickness & requires multiple coats. However, the manual spray application is expected to grow the fastest by almost 4.5% each year till 2025. Automatic spray is another type of coating which exhibits uniform coats, enables material saving & has high throughput. This method also can cater to wide range of applications in consumer electronics & industrial electronics. Aerospace & defense, automotive, consumer electronics, appliance controls, industrial controls are the major end-users of electronic protection device (PCB, LED board) coatings industry. Although aerospace is a comparatively smaller segment in terms of volume, the revenue generated from the segment is about 25-30%, because of use of higher cost materials such as paraxylene & silicone. Consumer electronics and appliances control together account for almost 50-55% of the total electronic protection device coatings market, and this share is expected to rise till 2025 driven by strong demand of consumer electronics in emerging economies of Asia and Africa. EPD coatings market for industrial control end-user consists of motors & relays, and this segment is expected to grow at a steady rate of 3.5% till 2025. As the electronic protection device coatings market is directly linked to the PCB industry, Asia-Pacific, especially China is the largest & fastest growing region. China accounted for almost 80% world’s PCB production. 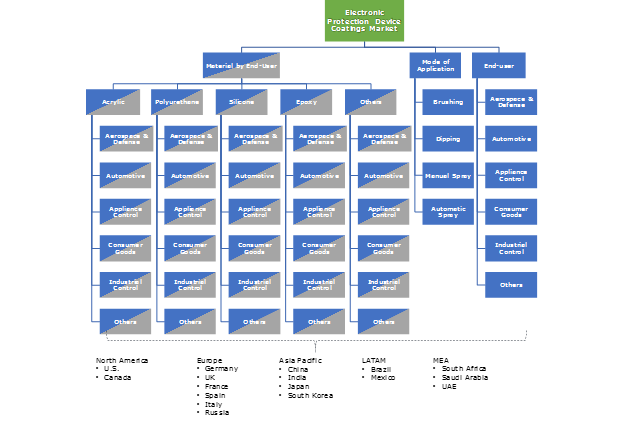 The other growing markets of Asia-Pacific are Japan, South Korea, Singapore & Thailand. Asia-Pacific accounted for almost 80% of the total market and is expected to grow at a CAGR close to 5% driven by availability of low cost materials & skilled labor at cheaper prices & presence of large end use companies. North America is the second largest EPD coatings market and is expected to grow by 3.6% each year during the forecast period. While electronic protection device coatings market of Germany, France, UK are expected to grow at a slower pace in the entire Europe market. Prominent players operating in the EPD coatings market are Henkel AG, Electrolube, Chase Corporation, HB Fuller. MG Chemicals among others. Chase Electronic Coatings is a leader in this market that offers solutions to wide range of industries such as aerospace, automotive white goods, industrial controls among others. Companies in this business are maintaining their market share by introducing new innovative materials especially for the LED lighting industry. Electrolube, a leading player in the global electronic protection device coatings market has introduced new polyurethane resins for consumer electronics industry. Electronic protection device coatings are applied in thin layers to PCB & LED boards to protect from moisture, dust, debris and other environmental stresses. These coatings can be brush applied, dipped or sprayed manually or automatically depending upon the type of application. The EPD coatings market is driven by rise in demand of smart portable electronics, automotive electronics and smart phones.